MARTIN, Tenn. – The University of Tennessee at Martin will honor active military personnel and veterans during a Veterans Day Exposition on Friday, Nov. 9, in the Boling University Center, as well as during the final UT Martin home football game of the season Saturday, Nov. 10, at Hardy M. Graham Stadium. The Skyhawk football game against the Tennessee Tech Golden Eagles will kick off at 2 p.m. and include recognition and free admission for all active military service members and veterans with identification. 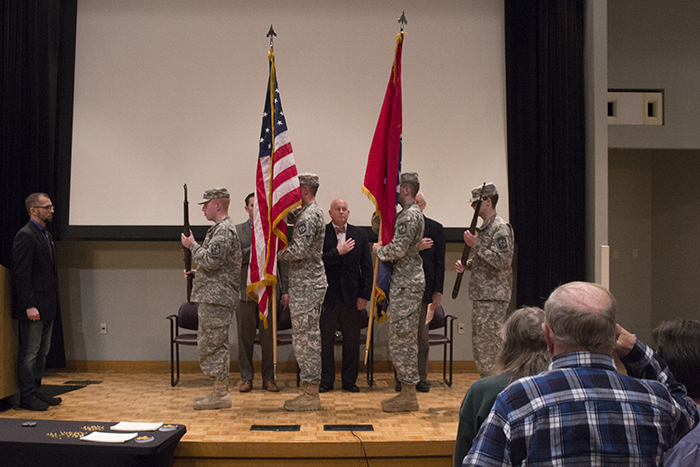 The Veterans Day Exposition will be held from noon-1 p.m. Friday in the Boling University Center’s Watkins Auditorium. The exposition is open to the public and sponsored by the university’s Skyhawk Veteran’s Association. In addition to honoring military veterans, Nov. 10 marks the 243nd birthday of the United States Marine Corps, and a birthday cake-cutting ceremony honoring the U.S. Marines will follow the exposition program in the Welcome Center located near the Watkins Auditorium lobby. The exposition will open Friday with the presentation of colors by the Army ROTC Skyhawk Battalion and the playing of the national anthem. Johnny Dyer, veteran services coordinator and a military veteran, will introduce guests and the playing of U.S. military songs. Dr. Alice-Catherine Carls, Tom Elam Distinguished Professor of History, will follow with a presentation about World War I. Carls is a member of the Tennessee Great War Commission and was instrumental in securing a grant to restore the World War I Memorial Fountain in Jackson. The restored fountain will be dedicated at 10:30 a.m., Nov. 17, on the northeast lawn of the Madison County Courthouse. Carls will be followed by remarks from Tennessee State Rep. Bill Sanderson (R-Kenton) and Chris Gunlefinger, UT Martin assistant director for student life and a Marine Corps veteran. Sanderson will then play taps to close the event. The Marine Corps birthday cake-cutting ceremony will follow. The university will also honor active military personnel and veterans Saturday, Nov. 10, at Graham Stadium as part of gameday activities for the final home football game. All active military service members and veterans will be admitted free to the game when they present identification at the stadium ticket booth. In addition, the Army ROTC Skyhawk Battalion will present the colors, reigning Miss Tennessee Christine Williamson will sing the national anthem, and Rolling Thunder will present the game ball prior to kickoff. Before these activities, a pre-game tailgate concert featuring Nashville recording artist Eric Chesser will begin at 11:30 a.m. in the stadium tailgating area. Information about the Veterans Day Exposition is available by calling 731-881-1689, and ticket information for Saturday’s UT Martin-Tennessee Tech football game is available by calling the Skyhawk Ticket Office at 731-881-7207. MARTIN, Tenn., Nov. 5, 2018 – HONORING OUR MILITARY – UT Martin Army ROTC Skyhawk Battalion cadets present the colors during last year’s Veterans Day Ceremony at UT Martin. This year’s combined Veterans Day Exposition and recognition of the 243nd birthday of the U.S. Marine Corps will held at noon, Friday, Nov. 9, in the Boling University Center’s Watkins Auditorium. The public is invited.